Kaiser Maximilian's Restaurant Week menu is being served through June 13. They will be closed for vacation from June 14 to July 25. The Espresso Bar and Main Dining Room will reopen on July 26, 2018. Puerto Vallarta, Mexico - Kaiser Maximilian is celebrating 23 years as one of the city's finest restaurants so, in addition to participating in Vallarta Restaurant Week 2018, which runs through June 10th, they'll be serving their special $466 peso, three-course menu for lunch and dinner through June 14th. 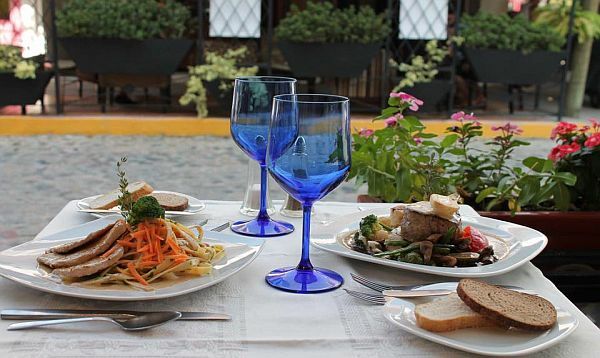 Now in its 14th year, Restaurant Week gives everyone a chance to sample some of the best food in Puerto Vallarta at exceptional prices. Most of the participating restaurants offer three courses with three options for each course, but Kaiser Maximilian gives you more choices. "The standard for Restaurant Week is three choices for each course," says Owner/Chef Andreas Rupprechter, "but I've decided to give diners more options for the same low price." At Kaiser Maximilian, you can choose between 8 appetizers, 9 entrées and 5 desserts - all developed from authentic family recipes. The restaurant's Austrian cuisine is expertly prepared with quality ingredients by their expert culinary team and served in an European bistro atmosphere. Kaiser Maximilian's Restaurant Week menu is being served at the Espresso Bar from noon until 11 pm and in the Main Dining Room from 5 to 11 pm through June 13th. The restaurant will be closed for vacation from June 14 to July 25. Both the Espresso Bar and the Main Dining Room will reopen on July 26, 2018. "I would like to welcome all of our long-time clients to our anniversary celebration," says owner Andreas Rupprechter, "and I hope this promotion encourages other to try our restaurant for the first time." The regular a la carte menu is also available.